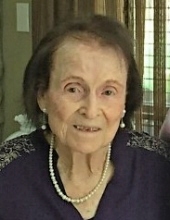 Ruth Largent, of Conroe, and formerly of Centerville, was welcomed into the arms of her heavenly savior the morning of January 9, 2019 at ninety-four years of age. A funeral service to celebrate her life will be held 1 P.M., Saturday, January 19, 2019 at Walters Funeral Home in Centerville. Ruth’s son, Pastor Tommy Largent, will officiate the service, and interment will follow in Mt. Tabor Cemetery in northern Madison County. A brief visitation will take place from 12 noon until service time, Saturday, January 19th at the funeral home. Ruth Marie (Taylor) Largent was born May 4, 1924 in Madisonville, Texas to parents, Presley & Annie (Swinner) Taylor. She and her husband lived in the Houston area where he worked as a minister. Ruth was a devoted minister’s wife, mother and homemaker. She loved to crochet and was an excellent seamstress, often making items for her own family and others, as well. She also enjoyed the beauty of flowers and gardened a little bit, herself. Reading was also a pastime Ruth enjoyed, and "Gone With The Wind" always remained a favorite. Ruth also had quite the collection of cookie jars comprised of between one and two hundred! She had lived in Centerville since 1983 and was a founding member of Chapel of the Hills Assembly of God Church in Centerville. Ruth was a classy lady with a fiesty personality. She always spoke her mind and enjoyed sharing the story of her Lord’s saving grace to everyone. She remained a devoted woman of God until her last breath. Ruth was preceded in death by both of her parents; husband, Calford Largent; daughter, Melinda Restivo; great grandsons, Jeremy Lightfoot and Josh Farris and several brothers and sisters. Surviving family members include son, Tommy Largent (Fran) of Conroe; daughters, Marilyn Zoch (Kenneth) of Centerville and Pam Gressett (Bud) of Colorado Springs, CO; brothers, H.M. Mitchell (Thelma) of Garrison, L.C. Mitchell of Garrison and James Taylor (Bonnie) of Beaumont and grandchildren, Kim Wood (Gypson) of Centerville, Tania Bryant (Bill) of Conore, Wendy McCormink (Tommy) of Conroe, Annia Tubbs (Jerry) of Sanger, Kellye Williams (Matt) of May Pearl, Marla Pierce of Tomball, Calvin Zoch (Dawn) of Centerville, David Gressett (Amie) of Monument, CO, Lee Cortez of Dallas and Brad Gressett (Nadine) of Denver CO. Ruth is also survived by twenty-five great grandchildren and nineteen great, great grandchildren. To send flowers or a remembrance gift to the family of Ruth Marie Largent, please visit our Tribute Store. "Email Address" would like to share the life celebration of Ruth Marie Largent. Click on the "link" to go to share a favorite memory or leave a condolence message for the family.